Don’t you just love all those words back to back? And yes I was tempted to type “pea-zas” but I like having human friends. But before you’re like, “Why don’t you just make them a helping?,” we both know that won’t work. Tiny, sticky humans don’t want food you prepare FOR THEM. They wants yours. End of story. And before you’re also like, “Well why don’t you just make extra?” That won’t work either. They can sense it. They know, by some internal detector of evilness, that I’m making a bigger portion to share. And they won’t want anything to do with that act of kindness. The end. 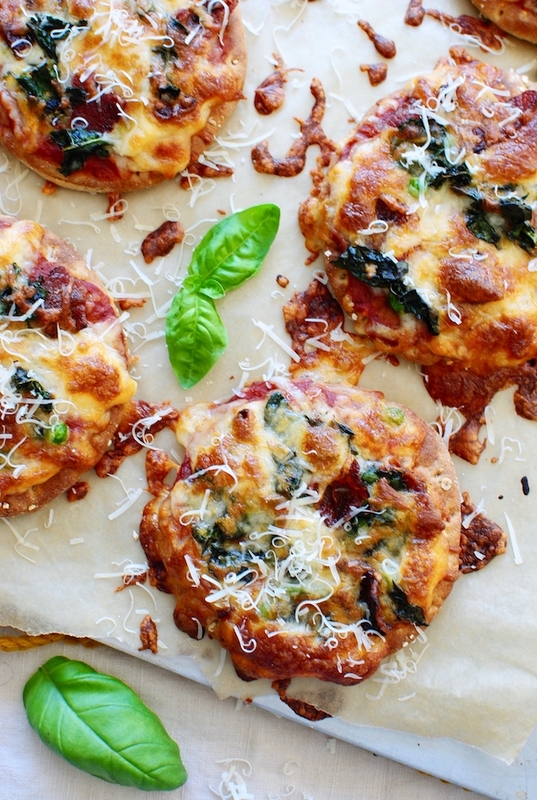 You can use any pizza base you want. I don’t know if base is the right word. I just mean bottom. Crust. Base. I found these little multi-grain flatbreads from TJ’s because words like “multi” and “grain” make me feel like a better person. But then you’ll level out the health with bacon because we want to love ourselves. Plus bacon and kale are like INSANETOGETHER. That’s sautéed kale! In the bacon grease. I like winning. Flatbread, some jarred or canned or homemade (you overachiever, you) pizza sauce. 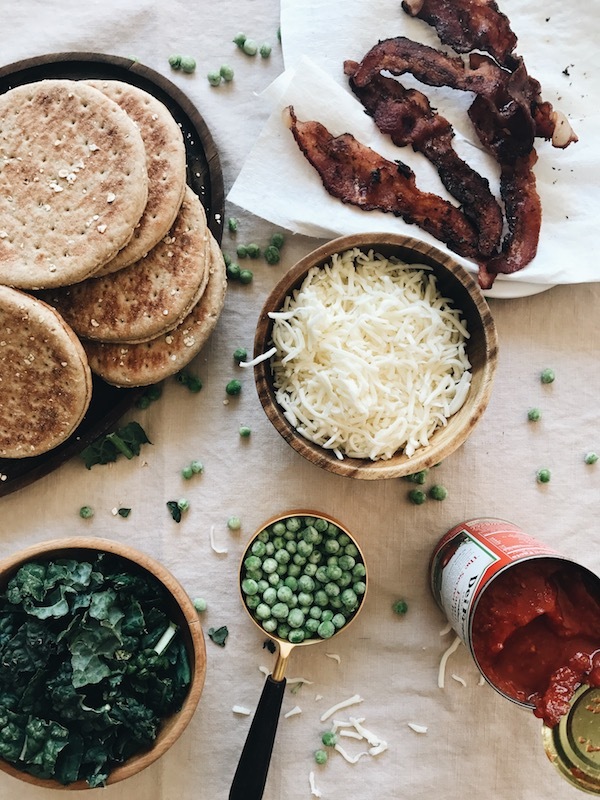 Kale, bacon, peas and cheese please. OH! Let’s start a band called Peas and Cheese Please. People hate us. 20 minutes later – bam bam bam. So good. 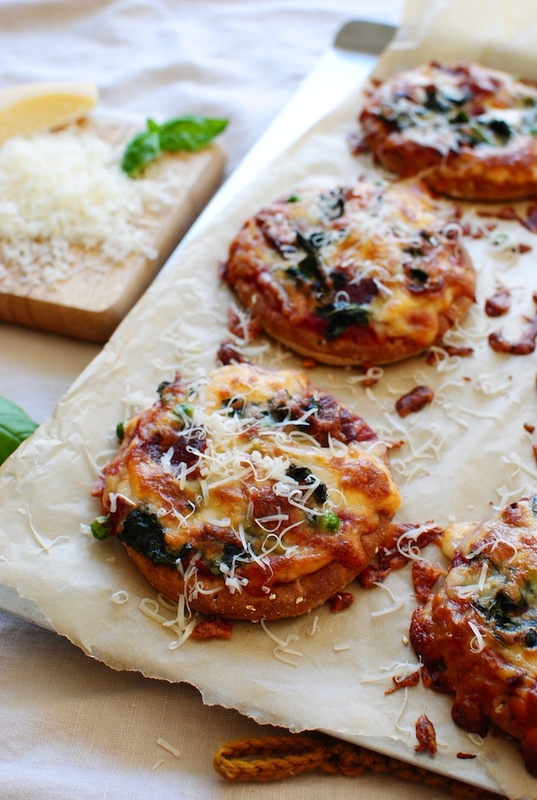 So cute and tiny and bacon-y and kale-y and in-your-face-y. Then top with a good sprAnkle of parmesan cheese and basil leaves. 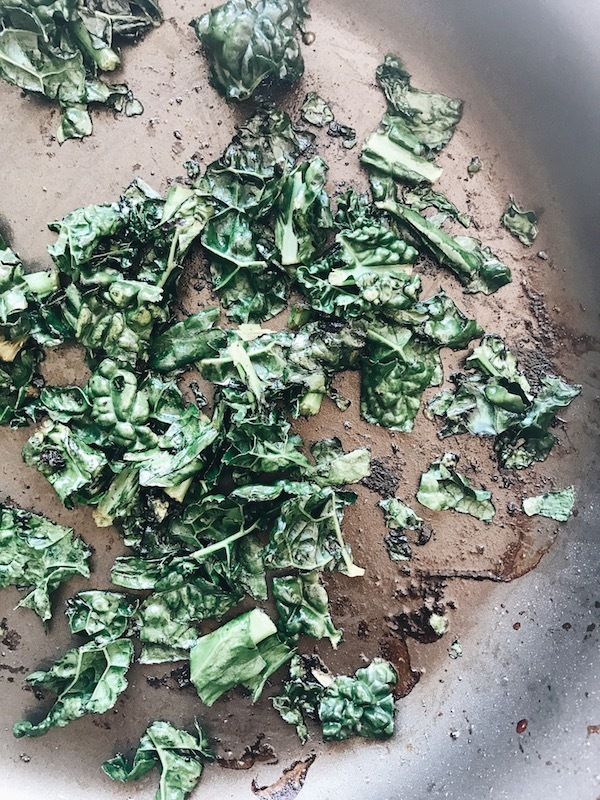 Once you’ve cooked your bacon, reserve a tsp or 2 of the bacon grease, and sauté the kale in it, until barely wilted. Season with a tiny pinch of salt. 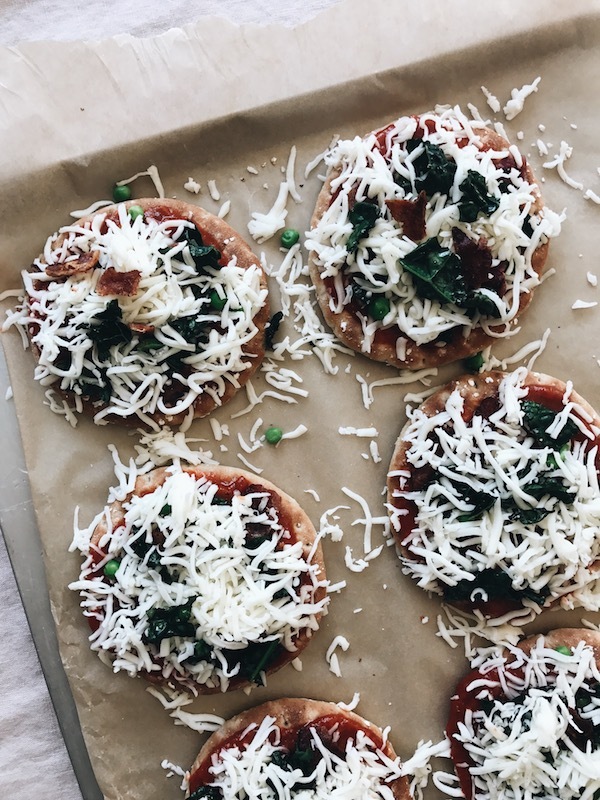 Arrange the pizza crusts on a large baking sheet. Spoon about a Tbs. 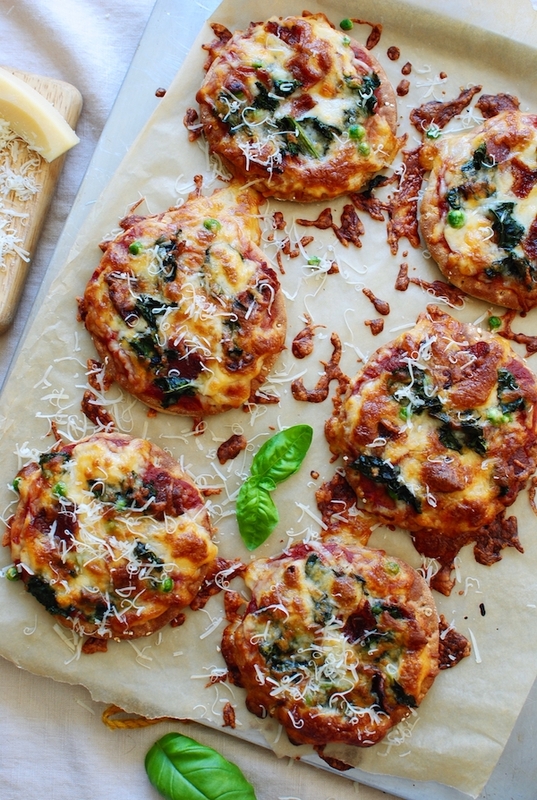 of sauce over each crust, then top with a little bit of cheese, kale, bacon, a sprinkle of peas, then more cheese. Bake for 20 minutes, or until the cheese starts to brown and bubble. 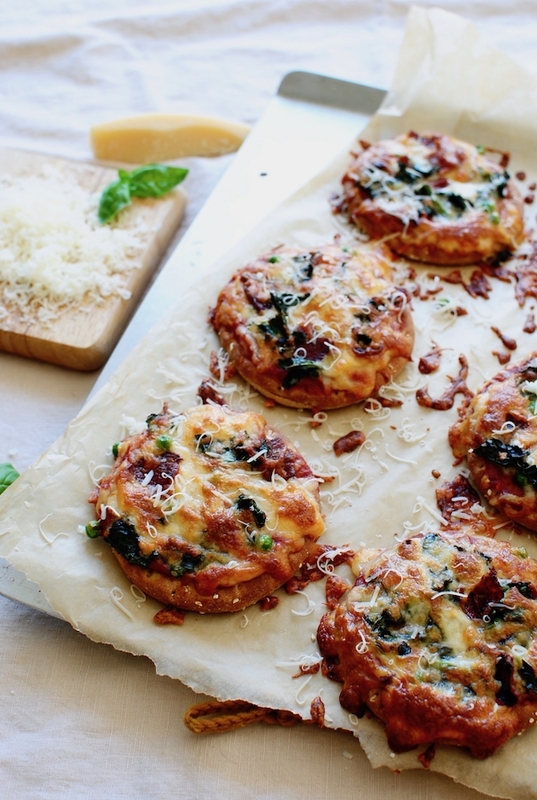 Garnish with freshly grated parmesan and basil leaves! YUMMM! These look amazing! Btw, the movie is Reality Bites. Scary that I know that. Haha. These look aaaaaawwwwwsooooome! And I'll bet my kids will love making themselves...although the won't end up with veggie inside. Just mounts of bacon! I don't even like kale! So it's totally wrong for your kids to love it and for you to eat it every day. Ha! These do look good though. Maybe I could sub in some spinach for the kale? What a great Pizza, I want to eat this delicious PZZA, it has great look and feels, Thanks for sharing such types of new look pizza.